We’d love your help. Let us know what’s wrong with this preview of Malicious Masquerade by Alan Cupp. Chicago PI Carter Mays is thrust into a perilous masquerade when local rich girl Cindy Bedford hires him. Turns out her fiancé failed to show up on their wedding day, the same day millions of dollars are stolen from her father’s company. While Carter takes the case, Cindy’s father tries to find him his own way. With nasty secrets, hidden finances, and a trail of revenge, i Chicago PI Carter Mays is thrust into a perilous masquerade when local rich girl Cindy Bedford hires him. Turns out her fiancé failed to show up on their wedding day, the same day millions of dollars are stolen from her father’s company. While Carter takes the case, Cindy’s father tries to find him his own way. With nasty secrets, hidden finances, and a trail of revenge, it’s soon apparent no one is who they say they are. To ask other readers questions about Malicious Masquerade, please sign up. Chicago private eye Carter Mays is hired by Cindy, a rich debutante, to find her missing fiance. At the same time, Cindy's father is also searching for the fiance who walked out on Cindy's wedding day. A twisting plot leads both men scrambling for alternate reasons to find the man who disappeared and seemingly stole millions from Cindy's father. I enjoyed Carter's dry humor and chivalrous gallantry. The beginning of this book hooked me right away and I loved all the plot twists that made me const Chicago private eye Carter Mays is hired by Cindy, a rich debutante, to find her missing fiance. At the same time, Cindy's father is also searching for the fiance who walked out on Cindy's wedding day. A twisting plot leads both men scrambling for alternate reasons to find the man who disappeared and seemingly stole millions from Cindy's father. I enjoyed Carter's dry humor and chivalrous gallantry. The beginning of this book hooked me right away and I loved all the plot twists that made me constantly question motives. Won this on Goodreads. Wonderful book. If you love a good suspense novel this is for you. Can't wait to read more from Alan Cupp! I enjoyed this book tremendously. Being fairly familiar with Henery Press, this was a refreshing change of pace compared to some of their other great reads. After her fiancé pulls a no-show on their wedding day, Cindy Bedford hires a private detective to track him down. And what P.I. Carter Mays finds out is anything but expected. I really enjoyed watching Cindy Bedford's struggle between what is morally right and family loyalty. Near the novel's end, Cindy discovers that her family isn't perfec I enjoyed this book tremendously. Being fairly familiar with Henery Press, this was a refreshing change of pace compared to some of their other great reads. I really enjoyed watching Cindy Bedford's struggle between what is morally right and family loyalty. Near the novel's end, Cindy discovers that her family isn't perfect and is in to some bad business. She's forced to choose between doing what is right and standing by her family. It's a hard decision for anyone and Alan Cupp captures the difficulty of that decision perfectly. Where is Tyler Moore? That’s the question Alan Cupp has us asking in Malicious Masquerade. When Jasper Bedford’s daughter, Cindy, is jilted at the altar, Jasper begins to wonder if something may have happened to Tyler. Jasper quickly assembles a search team and the results surprise him, yet yield little information as to Tyler’s whereabouts. Unbeknownst to Jasper, Cindy hires a private investigator to find Tyler because she believes something must have happened to him. Jasper tries to convince C Where is Tyler Moore? That’s the question Alan Cupp has us asking in Malicious Masquerade. When Jasper Bedford’s daughter, Cindy, is jilted at the altar, Jasper begins to wonder if something may have happened to Tyler. Jasper quickly assembles a search team and the results surprise him, yet yield little information as to Tyler’s whereabouts. Unbeknownst to Jasper, Cindy hires a private investigator to find Tyler because she believes something must have happened to him. Jasper tries to convince Cindy of the truth: Tyler used her for monetary gain; despite showing her evidence of his guilt, she doesn’t believe it. When she meets with Carter Mays, the Chicago PI she hires, she’s convinced he can find Tyler within days and Carter is unsure if he wants to take this case. He has a reason to be suspicious: the authorities haven’t been alerted to Tyler’s disappearance. The deeper Carter digs, the more he uncovers and soon he’s questioning who he can trust. Character development is strong and yet we don’t really get to know Carter. It was almost as if Cupp focused primarily on the Bedfords with Carter being secondary. Don’t get me wrong, it works, but at times I wanted to know more about him. In the end, this is about finding Tyler and uncovering his motives and as I mentioned, the set up works. I really liked how Cupp shows us how much Cindy has grown. At the end, she’s no longer this spoiled rich girl and when she realizes her father’s true business dealings, she’s conflicted on what to do. I’m not saying what she decides, but it is definitely in keeping with her personality. I’m not surprised at how Jasper and Darlene turn out. I admit feeling sorry for Darlene at times, but it’s apparent she likes to be miserable; she and Jasper are made for each other. There are a lot of hidden agendas in Malicious Masquerade and Cupp does a terrific job keeping the reader on the edge of their seat. The plot was well executed with a few minor hiccups (explained further down), but he slowly feeds you information. Based on the clues we’re given it’s up to us to decipher them. I was thrown off course a few times, but felt vindicated in the end when it all came together. I still feel as if I had no idea what to expect and I love when writers do that. Now in terms of the secrets, wow-the business aspect of Jasper’s dealings was mindboggling. We’re told Tyler stole several millions from Jasper, but no one is sure how because Jasper and his business partner, have an intricate security system. The pieces come together at the end and everything is well placed. I debated with the rating and it would have been solid five had a few things been cleared up. There’s an incident involving Carter’s house and it’s assumed Jasper had something to do with it, but the more I think about it, the more I’m convinced Tyler was behind it. If it was Tyler, it’s never expanded on despite the fact one of Jasper’s men is found murdered down the street from Carter’s house. There’s also the issue with several listening devices found in Carter’s office. It is assumed Jasper planted them and I most certainly can believe it, but still I can’t let go of the possibility of Tyler having something to do with it and him wanting to know how close Carter was to finding him. The bottom line is Malicious Masquerade is a highly enjoyable read. I’m looking forward to more of Alan Cupp’s work. 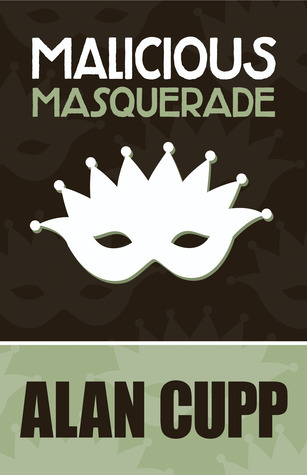 Malicious Masquerade by Alan Cupp is a very fast paced story of a life of crime hidden behind a mask of fame and fortune. There are many twists and turns that make the reader feel he is sliding down a slippery slope of pain and confusion. But amidst all the trauma, a love affair starts to bloom. Cindy Bedford is the daughter of Jasper Bedford, a very rich entrepreneur in the world of construction. She has led a spoiled life and now is going to marry the man of her dreams, Tyler Moore. But her dreams end abruptly when she is left standing at the altar. Not only has he disappeared, he stole millions of dollars from her father. Cindy can’t believe any of this is true. She fears something terrible has happened to Tyler. She can’t accept that he never loved her. She hires a P.I. named Carter Mays to find him and learn the truth. What she doesn’t know is that her father doesn’t want Tyler found because he has a secret life hidden behind his façade as a decent, hardworking man. So he does everything possible to find Tyler himself. One twist leads to another and another and the truth finally comes out. Cindy is shocked to find out that her father is a hypocrite who has lied to her all her life. Everything she believed in was now destroyed and she has to pick up the pieces of her life and start over. With the help of Carter Mays, she may actually be able to do it. This was a fun, energetic story whose characters were very true to life. It makes us realize that life is not always what it seems and sometimes, a lot of good can come from a lot of bad if we have the courage to look ahead and move on. It's very rare that males tend to write humourous mystery novels , ones along the lines of Janet Evanovich and Lisa Lutz , but Alan Cupp has stepped up to the plate and delievered his new novel Malicious Masquerade. Imagine waiting at the altar only to learn that the guy you were going to marry is not what he seems and that it looks like he has stolen over seven million dollars from your family , money that was hidden in secret accounts and if word ever got out , then Jasper Bedford would be done It's very rare that males tend to write humourous mystery novels , ones along the lines of Janet Evanovich and Lisa Lutz , but Alan Cupp has stepped up to the plate and delievered his new novel Malicious Masquerade. Imagine waiting at the altar only to learn that the guy you were going to marry is not what he seems and that it looks like he has stolen over seven million dollars from your family , money that was hidden in secret accounts and if word ever got out , then Jasper Bedford would be done for. That is what has happened to Cindy - on the day of her wedding her fiance Tyler disappeared and now her father thinks that he is responsible for theft and lots of it. Can Cindy hire a PI - Carter Mays to discover what really happened to Tyler ? What will happen though when Tyler rings Jasper and it is discovered that he has set him up to look like he has been soliciting in Child Prostution ? As Cindy and Carter start their own investigation , will they get out before trouble hits the fan or will they uncover sordid details that will leave Carter's life hanging on the balance ? Will Carter at the same time get the girl Cindy or will we read about Cindy going back to Tyler ? Amazing. Yes that is what I think of this novel. Truth telling, I had purchased this book along with several others back in early 2013. Every time it came to the top of one of my TBR (to be read) piles, the cover just didn't appeal. Now due to illness and finances I am reading my TBR's. What came to the top? "Malicious Masquerade." This book had so many twists and turns that I never saw what was coming next. The book begins with a simple plot. A wealthy girl is left stranded at the altar. She hi Amazing. Yes that is what I think of this novel. Truth telling, I had purchased this book along with several others back in early 2013. Every time it came to the top of one of my TBR (to be read) piles, the cover just didn't appeal. Now due to illness and finances I am reading my TBR's. What came to the top? "Malicious Masquerade." This book had so many twists and turns that I never saw what was coming next. The book begins with a simple plot. A wealthy girl is left stranded at the altar. She hires a PI to find him. She wants answers. Well, all I can say is be careful of what you think you want...cliché or not, you just might get it. Poor Cindy did and years of trauma more! There was murder, theft, identity switches, lite romance, you just name it. I found myself having to finish the book no matter how late the hour. I don't think of myself as someone who likes PI mysteries, but I really enjoyed this one! I think that's because of the humorous voice and the fact that it's a traditional mystery that keeps up the suspense without being too gritty. I did guess what was going on, but there were enough clever twists and turns to keep me reading and smiling. Non-stop adventure! Good, fun read, full of terrible villains and an admirable main character. We don’t learn much about the main character through the story, but I guess that happens in a plot-driven book. I prefer character-driven books so I missed getting to know what drives the main character. Intriguing plot overall with several twists. The last third was a little weak, but I'd try this author again. If you love puzzles and deep plots, this should be a wonderful read for you! It begins with a bride (Cindy Bedford) anxiously awaiting her groom to show up at the church. The mystery deepens when he does not show and the evening falls only to find that he has packed everything and has taken money from her father’s safe as well as from his accounts at his company (from illegal accounts she doesn’t know about). Devastated and angry…still in shock she hires Carter Mays, private investigator and former Chicago PD to find her vanished love so she can get the closure she needs or wants. Cindy Bedford is a spoiled princess, but very lovely woman who has loved Tyler Moore for three years and accepted his proposal. Encouraged by her father Jasper Bedford, who thought the sun rose and set in Tyler, she was expecting a much different life than what she now had. The investigation begins slowly and reveals more to the detective than he bargained for. Cindy doesn’t know her businessman father is also a heroine importer on the side (supporting his finances). She’s daddy’s little girl and has no clue as to her father’s true nature. Her mother Darlene, a functioning alcoholic, knows all the secrets, but the two have worked hard to keep Cindy in the dark. Mays is a professional and all around good guy, handsome and kind. Very clever, he does his job well. Even followed by Jasper’s thugs he manages to make small headway into the mystery of Tyler Moore, while trying not to fall for the lovely Cindy. I don’t want to spoil the entertainment of going through this investigation learning and thrilling to the various changes to the story. Mr. Cupp has written a very intricate and compelling mystery. It builds slowly and surely to an enticing peak of danger and discovery. Get a good glass of wine or two and enjoy the ride. Of all things Alan Cupp’s book is not, Malicious Masquerade is not predictable. Cupp twists and turns the story, causing us to wonder what will be uncovered next. Private Investigator, Carter, reminds me of Italian singer, Dean Martin. Martin crooned love songs softly and you’d think he didn’t have to practice at all. Carter takes his work seriously, but he works hard to discover each piece of the mystery puzzle and fit it into place. One can tell the P.I.’s been at his profession a long time. I Of all things Alan Cupp’s book is not, Malicious Masquerade is not predictable. Cupp twists and turns the story, causing us to wonder what will be uncovered next. Private Investigator, Carter, reminds me of Italian singer, Dean Martin. Martin crooned love songs softly and you’d think he didn’t have to practice at all. Carter takes his work seriously, but he works hard to discover each piece of the mystery puzzle and fit it into place. One can tell the P.I.’s been at his profession a long time. I love his easy style. Cupp presents a plethora of situations needing answers, including why a groom would not appear at his wedding and why at least $30,000 is missing. Excellent writing brings all our questions to resolution as Carter uncovers the real people behind their social masks. A great read. Cindy should be having the happiest day of her life- her wedding day. But her fiancee, Tyler, never shows up, and her dad, Jasper, suspects him stealing money from him and his business. Cindy thinks that someone has kidnapped him- so she hires a PI, Carter, to find him. Both Jasper and Carter are searching for Tyler; both want to find out what happened to him; and one wants to make sure that Tyler pays for the sins he committed. I thoroughly enjoyed this mystery thriller. It's filled with twists and turns throughout the novel. The author is a very good storyteller and paints the scenes and characters well. Every chapter revealed some mystery but added even more, taking the reader on a road of twists and turns to an action packed ending. Malicious Masquerade is a dark, cozy, mystery thriller about power, greed, manipulation, revenge, and murder. This starts with a missing bridegroom and quickly turns into a jilted bride, angry father, and young detective with too many questions mystery. Again and again the plot veers as new revelations appear. All is not well in the household, and the daughter is the last to learn. The reader thinks she know where this is headed, but the plot continues to surprise. Very good read. Loved it!! I've been enjoying the books from Henery Press lately so I thought I would give this one a go. It's a great mix of suspense, mystery and humour with a dash of romance. Can't recommend it highly enough and I look forward to more about P.I. Carter Mays. This was a great book. I couldn't put it down! Hope there are lots more in this series. I was given an ARC in exchange for my honest opinion. This book cover is on my Pinterest board and my blog, Michelle Dragalin’s Journey.